Baker Donelson is one of the few law firms in the nation with a niche national practice dedicated to representing lenders and borrowers in HUD-insured loans for commercial, multifamily and senior housing projects. Lender's counsel in the first HUD 223(f) refinancing transactions of Section 202 loans to occur in Virginia and Georgia, and in the first HUD Section 232 LEAN transactions to occur in North Carolina and in the Kansas City HUD Hub office. 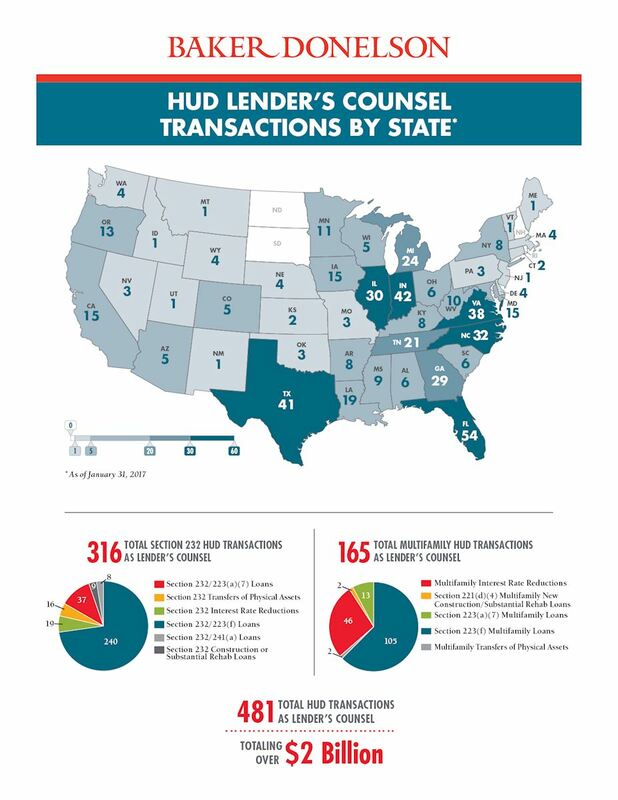 Lender's counsel in hundreds of HUD loan transactions throughout the nation, including loans for market rate apartments, nursing homes, assisted living facilities, subsidized senior housing apartments and long term care facilities, and also including several portfolio transactions of various sizes under HUD's LEAN program. Borrower's counsel in portfolio of approximately 75 Section 232/223(f) HUD loans to various nursing home and assisted living operators in 24 states and in numerous other HUD portfolio transactions of various sizes. Baker Donelson is one of the few law firms in the nation with a niche national practice dedicated to representing lenders and borrowers in HUD-insured loans for commercial, multifamily and senior housing projects. Baker Donelson attorneys have been counsel in hundreds of such HUD-insured loans for lenders and borrowers, which together total well over $2 billion. Baker Donelson has the experience that borrowers and HUD-approved lenders require to navigate around the pitfalls and opportunities involved in commercial HUD transactions, including refinancing, acquisition, substantial rehabilitation and new construction of apartments, senior housing and long term care facilities, transfers of physical assets of facilities with existing HUD financing, and acquisitions of HUD-foreclosed properties. Our attorneys have developed relationships with HUD attorneys and staff in almost every HUD field office throughout the nation, and have closed HUD loans on site in Los Angeles, Baltimore and many HUD offices in between. We also have developed a network of experienced local counsel throughout the country to provide assistance in delivering opinions and counseling on issues relating to the laws of the jurisdiction in which the facility is located. Represented a health care lender in a bridge-to-HUD loan secured by nine skilled nursing and assisted living facilities, including the negotiation of accounts receivable financing. Borrower's counsel in a portfolio of 55 223(f) refinancing transactions of Section 202 loans located in 14 states. Borrower's counsel in numerous bridge-to-HUD loans involving HUD takeout loan structure, including a portfolio involving 17 health care facilities in eight states. Baker Donelson is proactive and timely. They jump on stuff. If a client isn't getting enough information, they will prompt us to do things. With Baker Donelson, stuff doesn't drop through the cracks. It's hard to think of just one way they exceeded expectations... We had some bridge to HUD deals with Baker, and they were able to turn the docs and manage portfolio financing and really turn things around on crazy tight timeframes. It was very impressive.